Hillary Clinton says she'd want to overturn Citizens United: Her super PAC supporters might disagree. 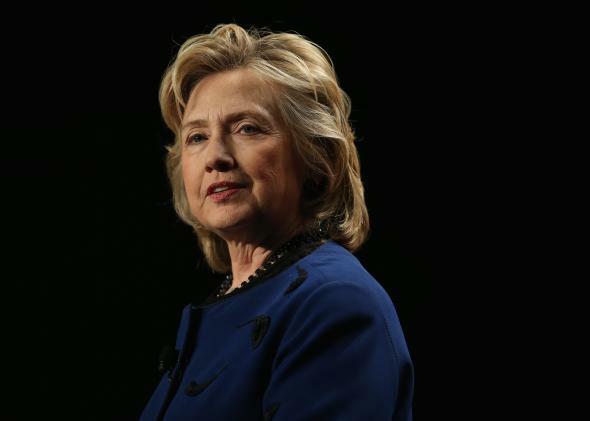 Hillary Clinton said Tuesday she intends to take on campaign finance reform during her 2016 presidential run. Holding her first official campaign event at Kirkwood Community College in rural Monticello, Clinton identified campaign finance reform as one of several pillars of her 2016 presidential campaign. “We need to fix our dysfunctional political system and get unaccountable money out of it once and for all—even if it takes a constitutional amendment,” Clinton said in opening remarks at a roundtable event with Kirkwood students and instructors. Ready for Hillary, a super PAC that raised tens of milliions in advance of Clinton’s announcement on Sunday, has rebranded itself as Ready PAC to avoid running afoul of one of the few restrictions it faces—having a declared candidate’s name in its title. Several of its staffers have migrated to Clinton’s newly official campaign, MSNBC reports, and a spokesman for the operation formerly known as Ready for Hillary told Slate Tuesday that they’ve “pretty much closed up shop” and declined to comment on her remarks. The Center for Public Intergrity, calling Clinton the “Citizens United Candidate,” noted last year that a case that started with an unflattering movie about Hillary Clinton would likely make her one of the best unofficially funded candidates in 2016, but could put her in an awkward position, given some of her past statements on campaign donations. While Clinton’s detractors will almost certainly accuse her of hypocrisy for denouncing the loosened restrictions on fundraising that have allowed her shadow campaign to amass a huge war chest, the Citizens United ruling offers an airtight defense: Since she is not allowed to “coordinate” with her unofficial army, she couldn’t make them stop spending money on her, even if she wanted to. Clinton is not the only presidential hopeful calling for an amendment to reverse the effects of Citizens United. South Carolina Sen. Lindsey Graham, who has formed a committee to explore a 2016 run, told WMUR in New Hampshire last Friday: “Well, Citizens United has gotta be fixed. Y’all agree with that? You’re gonna need a constitutional amendment to fix this problem.” Graham is free to take a stand on the issue with less risk than Clinton that he’ll be accused of hypocrisy, as he appears to be unencumbered by sizeable super PAC donations.